Soak the bread roll in a little milk and tear into small pieces. Beat the eggs in a bowl and mix with the cheese, garlic, parsley and bread. Season with salt and pepper. Add breadcrumbs little by little until you have a fairly dry stuffing mix. 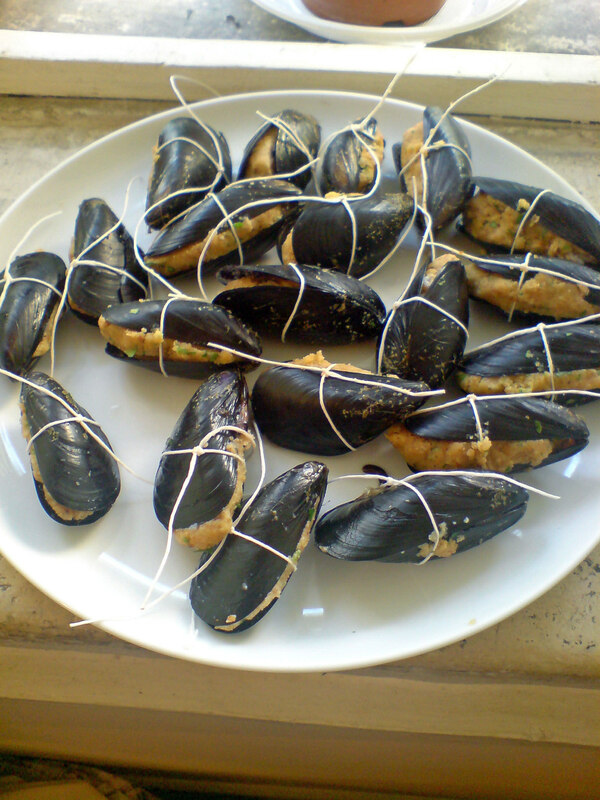 Stuff the mussels with the mixture and tie them almost closed with kitchen string. Don’t tie them too tightly as the stuffing has to come into contact with the cooking sauce. Heat some oil in a large pan and add some chopped garlic. When the garlic has coloured add the tomatoes. Cook over a medium heat for about 15 minutes. 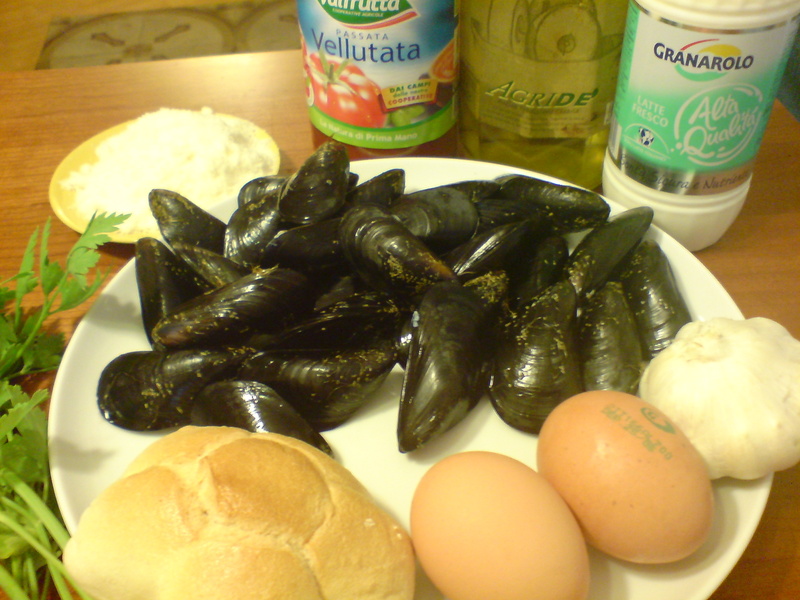 Add the mussels and cook for a further 15 minutes. 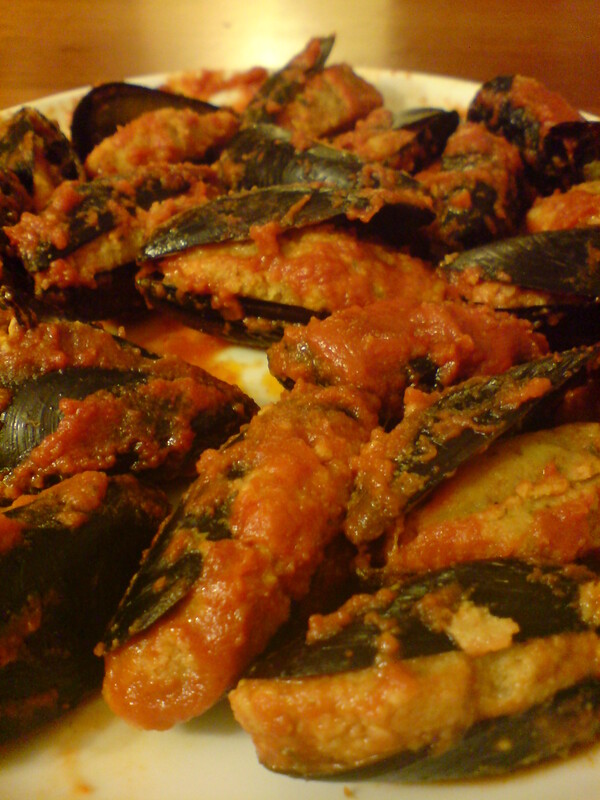 Remove the mussels from the sauce and remove the string. 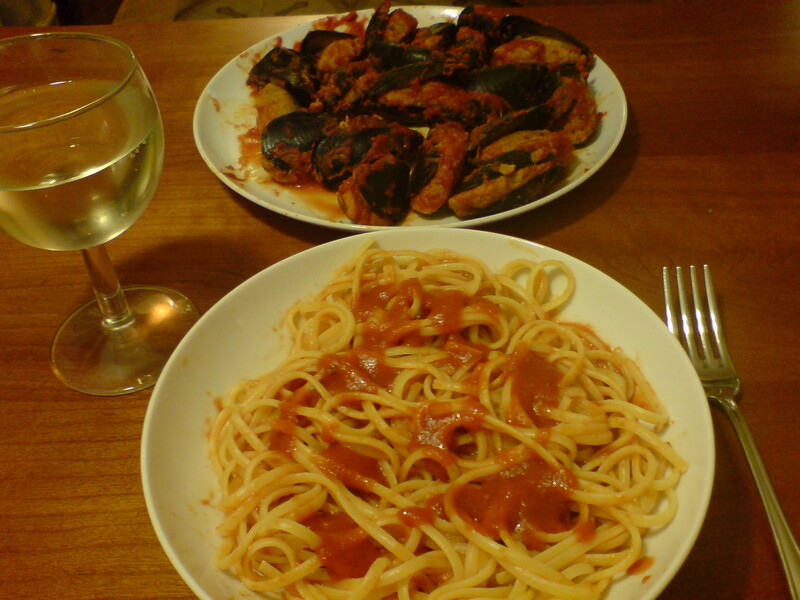 Serve the sauce with spaghetti or linguine as a first course. Fry the onions in plenty of olive oil for a few minutes. Add the cuttlefish and fry on all sides. Add the tomatoes and cook over a low heat for around 3/4 hour. When the cuttlefish are tender, remove from the sauce and keep warm. Season the sauce with salt and pepper. It probably wont need much salt as the cuttlefish can be quite salty. Dress the cooked pasta with the sauce. Serve sprinkled with the pecorino and parsley. Top each portion with one of the cuttlefish. 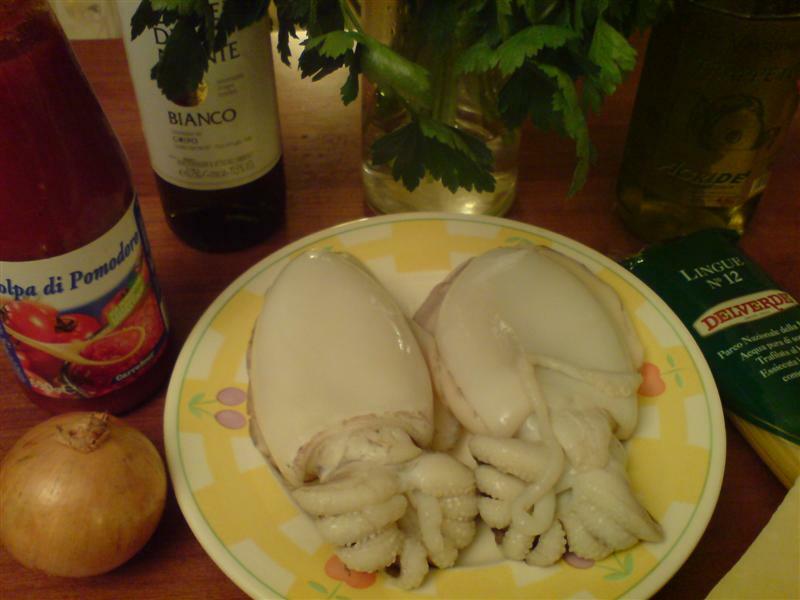 Note: If the cuttlefish are quite large, you may prefer to serve them as the second course. Don’t panic when I tell you the main ingredient is horsemeat 🙂 It works just as well with beef. Thanks to Antonella for the recipe. If you are wondering why there are more photos than normal, I prepared this dish so I could post the recipe on another forum. 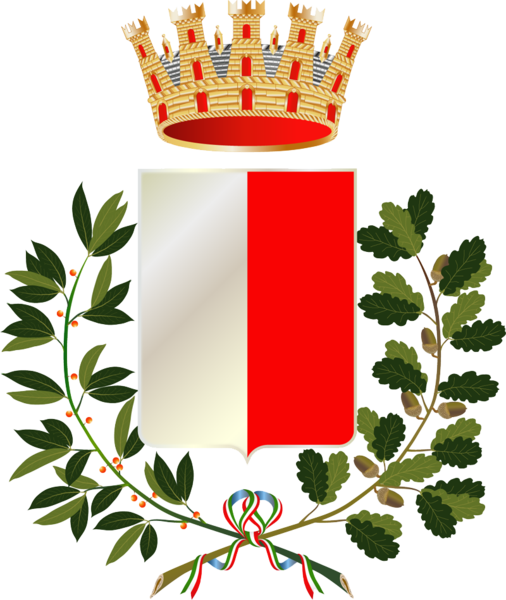 If you like you can serve the sauce with the pasta as the first course, and the braciole as the second course. 500g tomatoes – If you can’t get really ripe ones, use tinned. 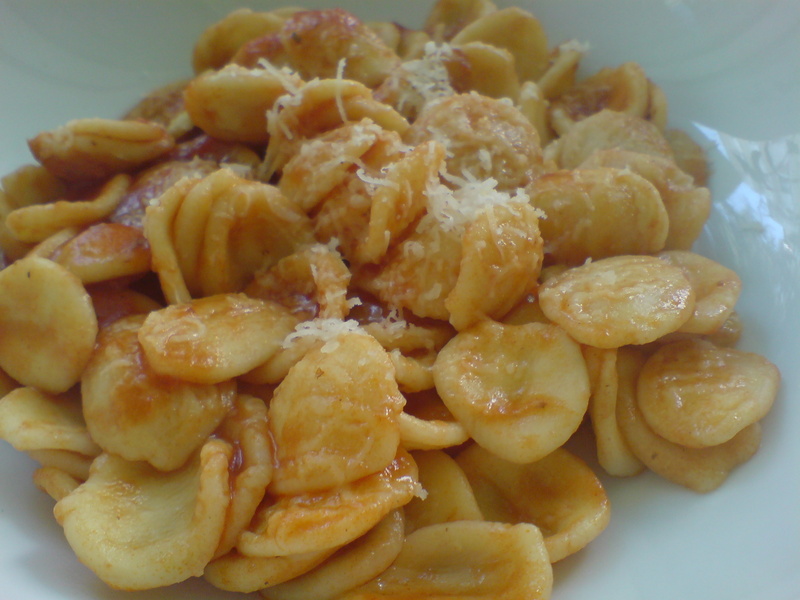 It can be served with just about any type of pasta, but here they use orecchiette (little ears). First peel, deseed and chop the tomatoes. It’s much easier if you cut an x in each one and blanch for about a minute. The skin virtually falls off. Brown the braciole in a heavy pot – one that’s good for slow cooking. Remove and put to one side. Add the carrot, onion and celery to the same pot. Fry gently until the onion is well coloured. Then add the tomatoes, cover and cook over a very low heat. Cooking time depends on the meat. It should be very tender, but not falling apart. Check every now and again with a sharp knife or a skewer to see when they’re done. Mine took about 3 hours. When they are done, remove the braciole from the sauce. Chuck in a bit of chopped basil. Toss the cooked pasta in a little of the sauce and divide between 4 plates. 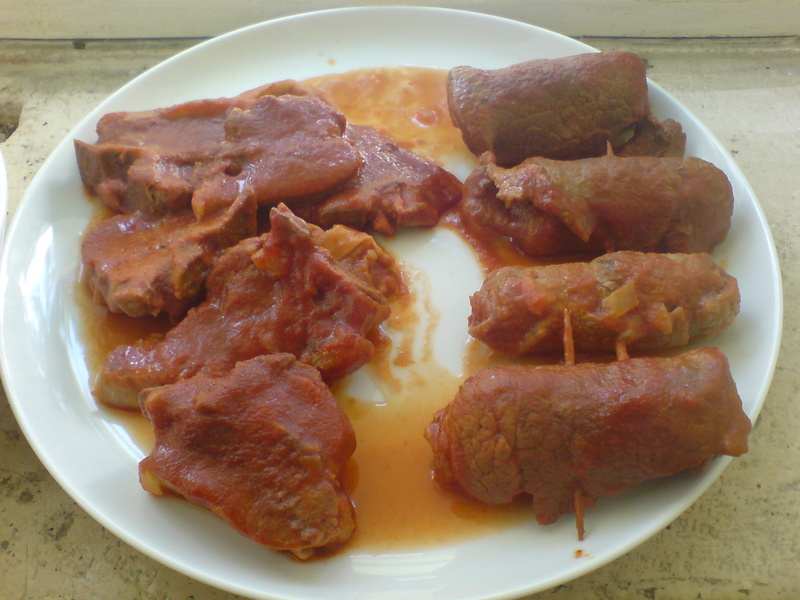 Remove the cocktail sticks and put 4 or 5 braciole on each plate. Top with more of the sauce, sprinkle on some parmesan and we’re away 🙂 Alternatively, serve the sauce with the pasta as the first course, followed by the braciole as the second course.